Disney's Photopass has been a great idea that you should take full advantage of during your next Disney World Vacation. 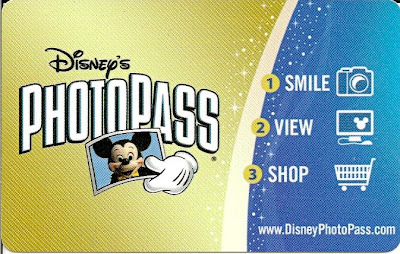 Photopass involves a card that is similar to a credit card that you can reuse during your entire Disney World Vacation. At each park there are several locations that Disney Photopass Photographers can take pictures of you and your family and scan your card. Either at a Disney photo shop location or from the comforts of your home after your vacation, you can look at the pictures that were taken and decide if you would like to purchase any. The best way to make full use of the Photopass photographers is to have them take pictures of your family whenever you see them. After they take the Photopass pictures, have them take a picture of your family on your personal camera. I have never had a Disney Photographer refuse to do so. This way you will have pictures of your entire family available from the professional taken on their camera, and on your camera. You have the option to decide what you want to get prints of after your vacation is over. No need to make a spur of the moment decision. This is a great way to get your entire family included in your personal vacation pictures as well. Although most Disney World vacationers are willing to take your family's picture on your camera, by having the Disney Photopass photographer do it, you will get some of the most scenic backdrops in all of Disney World included in your shots. So next time that you are worried that you will not be in any of your family vacation pictures because you are the designated photographer, remember the Photopass photographers and let them help include you in the memories. 0 comments to "Use Photopass & The Photopass Photographers To Get Great Family Photos At Disney World"